Volunteers set a new tree upright on Seminary Road. Volunteers planted a dozen trees in the Montgomery Hills neighborhood of Silver Spring Saturday morning in a community tree planting organized by nonprofits Casey Trees and Conservation Montgomery. 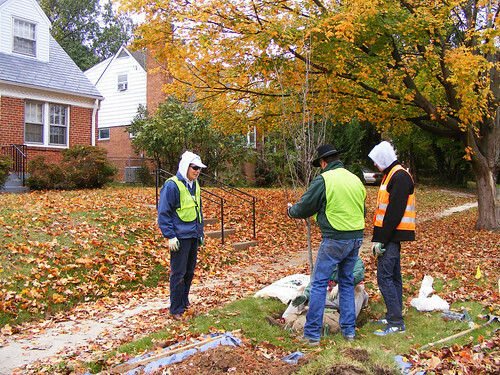 Based in Brookland, D.C., Casey Trees was founded 10 years ago to help restore the city's dwindling tree canopy. Since then, they've planted over 10,000 trees in the District. For Saturday's tree planting, Casey Trees' first project in Montgomery County, they teamed up with Conservation Montgomery, an environmental group advocating for a range of issues from tree-lined streets to watershed protection. The same day, they held another planting in conjunction with energy company Clean Currents at the Blairs in downtown Silver Spring. About 20 volunteers from around the region came out to plant a mix of swamp white oak, sweetgum and redbud trees along Seminary Road, Columbia Boulevard, and in Public Parking Lot 12, located at the corner of the two streets. Volunteers were given a demonstration on tool safety and planting before setting out with saplings and shovels. 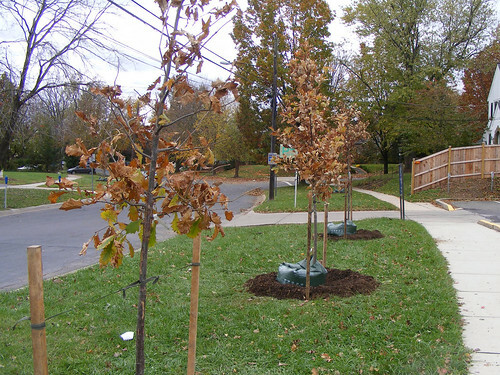 Newly-planted trees along Columbia Boulevard. Conservation Montgomery drew up plans for where each tree would go, working with a county arborist to avoid underground utilities, overhead wires and other barriers. They also consulted with neighbors. "We moved one [proposed] tree because it would create too much shade in one gentleman's garden," said Arlene Bruhn, who sits on Conservation Montgomery's board of directors. Jim Woodworth, director of tree planting for Casey Trees, noted the "traffic calming benefits" of street trees, which will not only look good and provide shade but encourage drivers to slow down. The planting site is less than half a mile from the Georgia Avenue/Capital Beltway interchange, one of the state's busiest intersections. Studies also show that one street tree can result in over $90,000 in direct benefits, ranging from increased property values to less air pollution. Casey Trees will hold additional community tree plantings through December, though there aren't any more scheduled in Montgomery County. You can learn more about them and their volunteer opportunities by visiting their website. You can also visit Conservation Montgomery's website to learn more about their organization as well. I helped plant this tree almost 20 years ago. Post-Script: Visiting Casey Trees and Conservation Montgomery's tree planting in Montgomery Hills reminded me of a tree I planted myself a few blocks away. 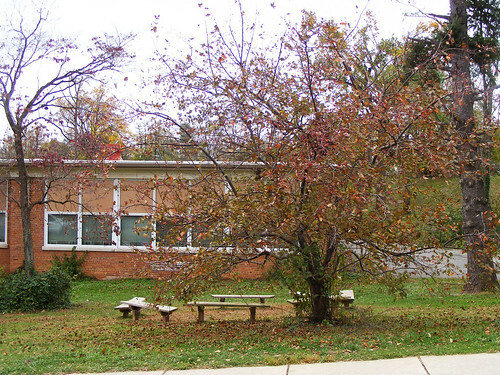 As a first-grader on the Woodlin Elementary School student council, I participated in the planting of this tree on the school grounds in 1993. I was surprised to find it's still there, though it could probably use a little pruning, as it's gotten very scraggly.